Swimming pool financing and the average costs of installing and building a swimming pool, common mistakes and questions to ask. Swimming pool construction cost is really no different than any other major purchase like a car or your home. Some pool companies, swimming pool dealers and lenders may even look upon the addition of a swimming pool as a "home improvement" and may be willing to work with you. Most lenders should look upon a pool as an investment into your home and possible increased resale value. And before you put a swimming pool in your backyard, remember you're going to need to make payments so plan carefully. We all know we you just can't say I'm gonna do it and BAM, there it is. There needs to be a plan, right? Maybe these thoughts will help you along the way. Will you have a smaller or larger sized swimming pool? Any additions such as hot tubs, waterfalls, outdoor BBQ island, swimming pool solar heater, electric pool heater, or decking? What's the total swimming pool costs? Some pool builders may finance in-house and may save you a great sum of interest in the long run. Some owners want a long-term loan with smaller payments. The down-side to this is you'll probably pay more interest. Some may want a shorter loan with slightly higher payments while others may want to finance only the pool and not the decking or landscaping. Are you building the house now? Ask if you can build the pool at the same time. Talk with your contractor about this and see what they say. Have you considered a HELOC? (home equity line of credit or loan) Is the loan a fixed rate or adjustable? Remember the most important aspect of any pool is swimming safety. Don't make a $25,000 mistake. Get the facts BEFORE you sign on the dotted line. 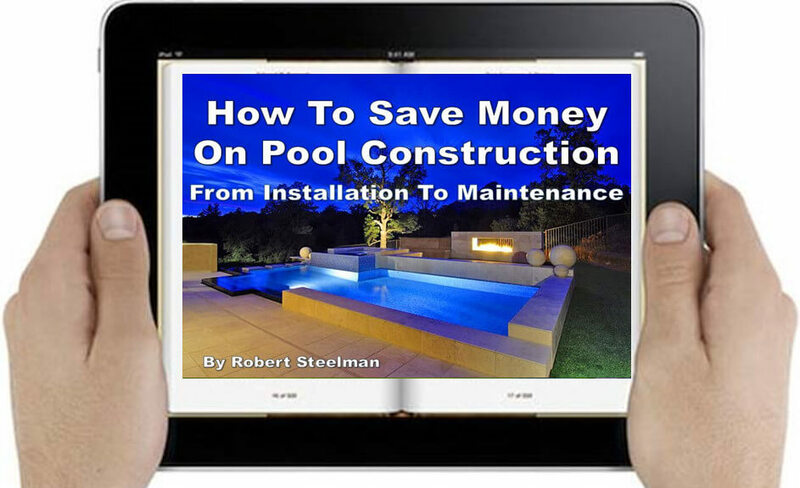 "How to Save Money On Pool Construction" is the authoritative eBook on saving money on your pool project. Filled with useful information from how to choose a contractor, what questions to ask, financial advice, how to know if a pool is right for you, and much more. I've been on dozens of pool construction sites since 1999 and have seen first hand the problems that can happen. Don't be a victim. Get the best information now and save thousands!! Click on the button below and get started today!! This is when the bank, or lending institution, uses collateral to secure the loan. Or they may opt to place a lien on your house. If you default on the loan, the lender can claim a legal right to your home as payment for the pool and get their money. Secured loans are the most common type of loan for swimming pool financing as it allows the homeowner to borrow against the equity in their home. These types of loans normally have lower interest rates and the payments can be spread out over a longer period of time. An unsecured loan means there is no collateral. The lender has no direct security on your home. Because unsecured loans are more risky for the lender, your interest rates and payments might be higher due to the contract is for a shorter period of time. Has the pool been well maintained? Any staining? Ripped vinyl liners? Filtration system properly working? There's no guarantee you’ll get a return on your investment. Most real estate agents I've spoken with since 1999 (in Arizona, Oregon, and Florida) have told me only when the circumstances were perfect that the homeowner could expect, at best, about 7% return. An inground swimming pool might add value to YOUR life and enhance YOUR home, but potential buyers might not see it your way. Value is in the eye of the beholder. And please don't be under the misguided notion that an above ground pool will add any value to your home. While they're great and have provided you and your family a great swimming experience, from a strictly financial point, they will not add value, nor will they be a good selling point. Most new buyers will simply sell them or tear them down. Inground Swimming Pool Cost: A Pain In The Wallet? According to Fixr, the average cost to build an inground swimming pool is $22,000. This is just for the pool and filter system. Accessories such as gazebos, wooden decks, and bbq pits will add to the cost of the pool. Vinyl pools are the least expensive with a standard cost of $25,000. Next in line would be fiberglass at $31,000. 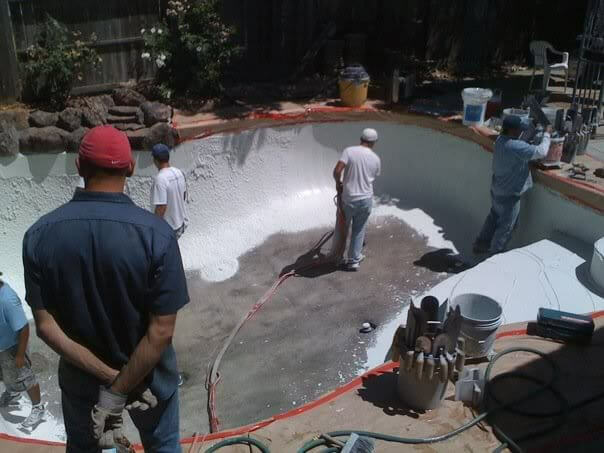 And the most expensive type of pool is concrete/plaster which can range from $31,000 - $50,000. Then we need to tack on water use, electricity, safety fence, weekly maintenance, chemicals, and, you get the point. It's basically this: You can expect to pay $1 per 1 gallon of pool water. This means that a 25,000 gallon pool will cost around $25,000. Don't allow your emotions to get the best of you. This is a business decision and you can't compromise on quality, workmanship, maintenance, warranty, or service. Don't get in over your head. Know the swimming pool costs and everything that goes with it. Do your homework, ask the right questions, find the right lender, and if it's not going to work, then drop it. Swimming pool financing takes time and energy, but if all the ducks in your pool life are lined up in a neat little row, it's worth it. You need to have a good pool plan, size up the project, be smart, think it through, take it all in, and examine every aspect. Having a swimming pool is fun but it won't be for long because you forgot to add up everything and now you can't make the payments.